Showing results for tags 'makro racer'. Just got a new makro gold racer pro kit when I opened it and it was short the extra bottom shaft for the small coil then the cover to the screen was scratched all up but the screen was not. The dust/rain cover had lite gunk on it and the adapter to make the charger fit usa plugs was in the the bag with the blots for the coils I would have expected that to have been in the blue box with the cigarette lighter adapter and the adapter for the headphones was plugged in to the headphones like they had been used. I contacted the company I bought it from and they are sending me the lower Pole that was missing and a new set of dust covers and said that it does not come with an adapter for the US and they put that in themselves also when asked about the scratches on the screen protector they said that happens in shipping as are coming from overseas and goes through customs although in my opinion it was pretty scratched up to have just been that although I'm not sure. This is my first detector of this kind of quality and I'm not sure if it's the learning curve or just me but I can't get it to pick up outside a .174 nugget no matter what mode I'm in or what settings I also placed my wedding ring on the ground which is a family heirloom that looks like I won the Super Bowl and it still doesn't pick it up very well. Just wondering what you guys thoughts were on this situation and what you would do in my situation. I'm not willing to say that the detector is bad at this point but I'm greatly leaning towards it. I kind of feel like I got a return or a demo what do you guys think. I got my new coil and played sick at work to run this thing on our claim. So the claim has lots of desert bed rock and very small gold on it. I have picked it over with the makro and the monster. Others have done the same with a sdc2300 and gb2. So, needless to say the pickings are slim these days. Matter of fact I have been skunked the last two times. Both of those times with the monster using the small coil. Not so this time out. I only found one small nug. It is .8 grains it was about 1.5"-2" down in a bedrock wedge. I am very happy with this coil. I really like the size and shape. I feel I could go toe to toe with a gb2 sniper coil, with this new setup. Dear Valued Members, This is to inform you that as of March 1, 2018: Racer (or as some people call it, the Red Racer) has been discontinued. Racer 2 - the wireless module has been moved to inside so the wireless headphones will not require a dongle anymore. Racer 2 and Gold Racer pricing has been adjusted as follows: RACER 2 STANDARD MSRP: $499 RACER 2 PRO PACKAGE MSRP: $649 GOLD RACER STANDARD PACKAGE $599 GOLD RACER PRO PACKAGE MSRP: $749 We will continue to work hard to offer you the best products at the best prices in this industry as we promised in the official announcement of the merger of Nokta & Makro Detectors a couple of years ago. Thank you all for your support! The page is still there but all the links to it are gone from the main page. Maybe Makro needs an archive section for discontinued models because there is still good information there for current owners and future purchasers of used machines. It makes sense with the new Kruzer series that something might have to give, and some detectors you can only lower the price so far before its not worth it anymore. Hard to believe the Racer came out just three years ago and amazing all the things the company has done in that three years. They move so fast it makes other companies seem to be standing still. Makro Wireless Headphones Compatible ? Hi just bought a new Nokta Impact and wondering if Makro Racer 2 wireless phones will work on it ? Makro Racer Scores 1420 Gold! Hi all I have a Macro Racer 2 .When I use the stock coil in salt water I have no issues ,it runs really smooth with no falsing,but when I change to the Mars 13 inch Discovery coil inch it runs very erratically and falsing....does any one else have this issue? Operating the Makro Gold Racer with 5.5x10 coil in All Metal Mode, ground balance 60 to 70; sensitivity 60 to 75; threshold 22; isat 6; tracking 0; low tune: freq shift 3; Sun Ray Pro Gold 150 ohm head phones; fully charged batteries; removed & cleaned coil scuff plate. Ground is wet from recent rain, on level and sloped terrain, no water. When running the scoop over the coil without touching the coil (with the detector on the ground or elevated with coil at angle to ground surface) get a rolling chatter in headset, on two occasions the detector shutoff. With the detector setting on the ground and the coil placed flat on the ground surface the chatter stops. Wrapping my hand around the shaft and coil cable lessens the chatter. Same issue with the stock Makro 35 ohm headset. When the head phones are unplugged the rolling chatter stops. No other problems with detecting detects boot tacks, lead shot, small lead fragments or small gold. What is going on, anyone else had this issue and found the fix? 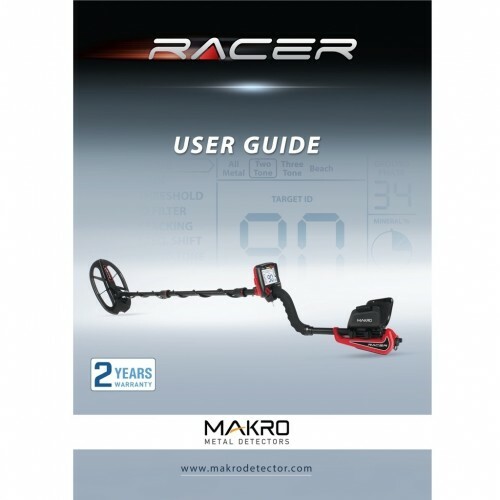 Announcing The New Makro Racer 2! Makro dealers are now taking pre-orders for the new 2.4 GHz wireless headphones and transmitter module for the Gold Racer and Racer 2. They will start shipping dealers in June. MSRP: $119 PLEASE NOTE THAT THE NEW 2.4 GHz HEADPHONE OPTION IS NOT COMPATIBLE WITH THE RACER AND WILL ONLY WORK WITH THE GOLD RACER & RACER 2 MODELS. This is the last picture that was available but the actual shipping units may vary in appearance. Anyone else have trouble pairing the wireless headphones? Did I maybe get a defective pair? Good day everyone, I'd like to tap in your knowledge for my next MD choice. 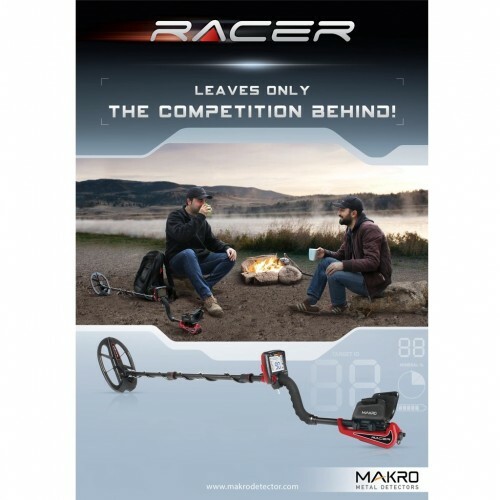 I've been using the teknetics delta 4000,then I saw that a local dealer is offering on sales a Makro Gold Racer and a Makro Racer 2 at the same price. I'd like to find small pieces of gold and the high freq of the gold racer should be ideal and i saw plenty of vids on youtube of its very high sensivity. But on the other hand I don't like the idea of getting stuck in a over specialized md. So my question is the following: is the gold racer viable also for coins, jewelry, or is built only for very tiny gold specs? Is the makro 2 more advanced? thanks! Dear Valued Customers: First of all, we thank you all for the increasing sales of our Racer series detectors. As you all know, Racer 2 is an addition to our current Makro product line up and we have no intentions of discontinuing the original red Racer. 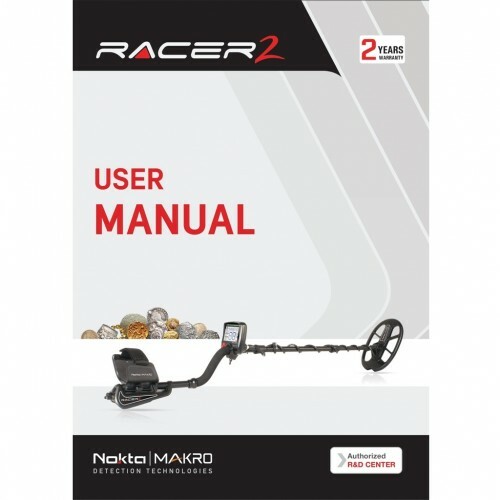 As a matter of fact, for those customers who do not need the extra features of the Racer 2, the original Racer still stands as a very good performing hi-end detector. Many of our dealers and customers have been asking Nokta& Makro for a device that would retail around the $500 price range.. Therefore, as of June 1, 2016 we changed the price of the Racer as below to meet this request. We believe that the new price change makes Racer absolutely the most competitive and attractive product in that price range! RACER STANDARD PACK SUGGESTED RETAIL $499 RACER PRO PACK SUGGESTED RETAIL $699 Thank you! Merton - You Get Your Gold Racer Sorted Out Yet? I knew yours had quit soon after you got it. Any details on what happened and has it been handled? The reason I ask is forum member SLGuin has apparently found new life as Slag on Tom's forum. He also reports getting a Gold Racer and having it fail. My Gold Racer is one of the first off the production line and I have had no issues, but overall with all Nokta/Makro models I have had some concerns over quality control. Early issues mostly revolved around plastics issues like coil ears and coil bolts breaking, but they seem to have that sorted out now. With you and Slag reporting Gold Racer failures I got concerned again, but some searching has not revealed this as being widespread. NokMak in general has been superb in fixing issues when they arise but if they really want to make serious inroads as a manufacturer they need to do all they can to put these types of issues in the past. In all fairness we see problems from all the manufacturers. A new (to us) company has more on the line however and can ill afford to get a reputation for building unreliable product. I got onto the site of an old shack recently with the Gold Racer. My gut feeling has been that the Gold Racer would be too hot for getting into thick ferrous, but it did a great job handling some pretty thick stuff and filling my pouch with non-ferrous targets. As usual flat steel is a challenge as it is with all detectors but I seemed to be getting a handle on it between audio and VDI responses. The unit has something special going with the disc VCO based audio and ability to make low conductors literally squeak. Anyway I know how you like hunting in the trash and hope you will be patient with the Gold Racer because I would like to compare notes with you on it if you continue to use it. I think Harry (LipCa) has one also but he is not saying much so maybe it is not working for him? Maybe he will chime in with a report. So far my only problem has been in trying to find the optimal way to deal with really hot ground. The Gold Bug 2 in worst case scenario you just switch to iron disc mode and it will shut most ground and hot rocks up with maybe just chatter at high gain levels. You can do the same with the Gold a Racer but with two disc modes and multiple disc settings it is more challenging, and I have not spent enough time on really bad ground to find what I think are the best solutions there yet. Northern Nevada is pretty tame and running in Disc Mode 1, Gain 79, ID Filter 10, iMask 0, and lowering tone break from 40 to 35 has been a good starting point for me. I set Disc Mode 2 up similarly but gain of 99. This is in general too hot for normal hunting, but once I get a target, I can switch to this to get a more solid response on weak targets. I do prefer the Gold Racer over the Gold Bug 2 when it comes to disc modes. The Gold Bug 2 has a silent search iron disc that silently rejects most ferrous targets. The Gold Racer can be set to do it this way also but you can vary the ferrous rejection (id filter) setting. In either case however I prefer a two tone setup, low tone ferrous, high tone non-ferrous. The problem with complete rejection is you can pass over a target and never know it was there. Borderline targets may give a poor reading that needs a little analysis and with a low tone alert you get a chance to stop and check questionable targets. The ability to set the tone break on the Gold a Racer really takes it to the next level because you can set the desired level of ferrous bias. I find the stock setting of 40 to be a bit too aggressive for my liking so 35 works better for me at lighting up smaller non-ferrous in bad ground with a high tone. The bottom line is due to my single minded use of the GPZ last year my Gold Racer did not see a lot of hours. Park hunting this spring got me going with it however and what I saw around the old shack intrigued me enough to make me intend on putting in lots more hours this year. I still consider myself to be a Gold Racer novice and would like that to change. I got the small elliptical coil now also and need to get it into use as that was my favorite coil on my Gold Bug 2. Makro Gold Racer and Racer 2 metal detectors Just some tidbits as I play around with these two detectors. The Makro Gold Racer unsurprisingly has an edge on low conductive targets, but even the Makro Racer 2 is geared towards low conductive. Both machines in two tone mode have a VCO type audio response. This means you get not just a solid tone, but a tone that increases with the signal intensity. As you get nearer a target the pitch of the tone increases, to the point that when right on top of a target it can practically squeak. Anyone used to running a Gold Bug will know what VCO audio sounds like. In two tone mode a nail, a dime, and a nickel do not respond quite the way you might think. The nail gives a very low tone response with both detectors. The nickel though will actually sound like a higher tone target than the dime even though in two tone both should in theory be the same. This is because both machines hit harder on a nickel than a dime and the VCO response kicks the tone up. On the Racer 2 and Gold Racer the dime sounds more like a mid tone, the nickel more high tone. This is a relative thing; both items at same depth the nickel hits harder. A deep nickel will sound however like a shallow dime. The Gold Racer at 56 kHz really enhances the low conductive signals, and it hits a nickel twice as hard as a dime. The Racer 2 may be more like a nickel hitting 50% harder than a dime. In two tone mode low conductors really jump out with the Gold Racer. The Racer 2 adds a three tone mode that cleans this up for classic coin hunters. It is far less a VCO effect, more solid tone, and high conductive targets at default settings give a much higher tone. So a nail will go very low tone, nickel solid mid tone, and dime solid high tone, again with minimal VCO effect compared to the two tone modes. Anyone hunting high conductive coins will find Racer 2 three tone mode to generally be the way to go. It is its own mode with its own responses and with a small coil can really do well on coins. That said the Racer 2 is not a depth demon on high conductive coins. I would not buy one just to hunt coins per se if max depth was the goal. It is a relative thing however. I played around with my Deus and 11" round DD coil and it also is no depth demon on high conductive. However, you can flip the Deus from 8 kHz to 18 kHz and watch the responses on a nickel and dime flip right along with the frequency. For just outright depth the Racer 2 and Deus are in the same ballpark in bad ground, but you can get a better high conductive response with Deus at 8 khz than Racer 2 at 14 kHz. My CTX 3030 does better than either in general for depth on coins though again the Racer 2 is very strong on nickels. I do not have the 10x5 elliptical for the Racer 2 so have used both 11x7 elliptical and 5" round DD coils on it. The stock 10x5 DD elliptical on the Gold Racer does a better job at target separation but also punches deeper in bad ground on low conductive targets than the larger coil on the Racer 2. Not in terms of absolute depth per se - it is just that the Gold Racer obtains and maintains a solid non-ferrous signal to better depths while in disc mode. The Racer 2 signal shifts more quickly to a ferrous reading at depth. This is probably a reflection as much of the frequency of the Gold Racer as the coil difference but I do prefer the 10x5 coil with the solid bottom and smaller footprint for what I personally use a detector for. I personally prefer the 5" round DD over the 11x7 DD for the Racer 2 unless I need ground coverage so the optional 10x5 DD would be a good compromise. The Gold Racer with 10x5 coil has tremendous target separation characteristics, easily matching or exceeding my Deus with 11" round DD coil. The super high frequency is unimpressive on high conductive coins at depth, but I have been finding surprising numbers of dimes at fairly shallow depths with it. The high frequency and ground handling I think may give it an edge even on high conductive coins in really bad ground as it hates to let any target VDI numbers get pulled down and with the superb separation - well, lets just say the Gold Racer does far better in parks than I was anticipating, but not because it punches real deep (except on low conductors) than perhaps because of its target separation/ground separation characteristics. The 10x5 concentric on the Gold Racer cleans up the complex multi signal that you tend to get with shallow targets and a DD coil, but does not handle the bad ground as well. It does seem to do even better on low conductors relative to high conductors in bad ground. It is as if the ground effect is canceling the high conductors more than the low conductors with the concentric coil. To the point where a nickel will bang out at twice the depth of a dime using the concentric on the Gold Racer. There currently is no concentric for the Racer 2. I prefer the 10x5 DD on the Gold Racer overall, as the mixed signal on shallow targets tells me they are shallow. But I like the concentric also - I just have not used both in enough different scenarios to have a hard grip on which is best for which situations. I do have two Gold Racers so will have to rig one up with the DD and one the concentric and run together to get a better feel on this. The Racer 2 oddly enough overloads more easily than the Gold Racer on shallow targets. Again I can use the overload as a shallow target indicator so it is not a bad thing, just a difference. Might bug some people though. My gut tells me the Racer 2 will overload on really, really bad ground that the Gold Racer will handle with no problem, but again coils play into that. The Gold Racer splits ferrous from non-ferrous at 40 and the Racer 2 makes the break at 10 (out of 0 - 99 on both machines). This is fine for most items. However, for non-ferrous in bad ground the Gold Racer has the distinct edge. Normal small ferrous on the Gold Racer bangs hard at about 21. The same item on the Racer 2 will hit at about 4. In bad ground, a small item like the smallest lead split shot fishing sinker you can get, will drift as low as about 4 with the Racer 2. The Gold Racer will see a similar item drifting no lower than about 35. That means on the Racer 2 ferrous and non-ferrous can bump right up against each other at about 4. I have been running my Racer 2 with ID filter and tone break set to 4 or maybe even 3 but have not settled on which might be best yet - probably just depends on the situation. The Gold Racer on the other hand you have a 14 point spread between where ferrous normally hits at 21 and a normal low end non-ferrous response at about 35. This is huge and means you have a far better ability to get clean separation between small non-ferrous and ferrous in bad ground. I like hunting jewelry and so depth is not a big issue. I like to hunt more for targets that have both extremely tight VDI clusters and strong responses that indicate they are not super deep. The 56 kHz and VCO response in two tone mode is really working for me. I basically hunt for "squeakers" and the Gold Racer really makes low conductive targets squeak. It is like hunting with a Deus in Pitch Mode. The Racer 2 works for this also but not as well due to the lower operating frequency. I really am just blabbing observations here in hopes there might be useful tidbits for somebody. I right now have four machines that overlap to some degree - Gold Racer, Racer 2, Deus, and CTX. More and more I am finding what works for me is a collection of specialty machines with specific uses. Minelab GPZ - nearly all nugget detecting Garrett ATX - water detecting DFX/Bigfoot - jewelry Minelab CTX - coin detecting The Gold Racer at 56 kHz is different enough to fit the bill for me as a specialty unit. Great for gold the GPZ can't see, or nuggets in trashy areas. But I am finding it to be a great park and tot lot hunter, not just for jewelry but for quite a pile of coins that have been popping up while jewelry detecting. Kind of like hunt jewelry and find lots of coins by accident. So it joins the group above. The Deus just has its own kind of magic and lots to learn there for me, so it stays put for awhile, possibly as part of the permanent collection. The Racer 2 though I am struggling with in a way. It is a great all around detector, and if it was all I had I would be quite happy. I prefer it to many of the other 13 - 15 khz machines on the market. But when I put it up against my core units - well, I like the Gold Racer more for gold/jewelry detecting. And I like the CTX more for chasing silver coins. The Racer 2 actually does give the Deus a run due to the small coil but the Deus has the four frequencies to work with and weighs a pound less. Costs twice as much also! So I run into a situation where the Racer 2 like the Fisher F75 or Garrett AT Pro or Minelab 705 or Teknetics T2 or White's MXT is a superb do-it-all machine. But for any one given task, one of my specialty units will eclipse every one of those detectors. So while I am in no hurry to part ways with the Racer 2 I am not really counting it as a core necessity unit either. It may do nearly everything well but I have not found that one magic thing it does better than anything else - and that is what it takes for a detector to find a permanent place in my collection. The Gold Racer though is getting double duty. If I go gold prospecting my GPZ is main unit, Gold Racer secondary though for specific situations the Gold Racer is lead unit. Same situation now exists with my DFX/Bigfoot and Gold Racer but a bit more a pair of equals there. The DFX/Bigfoot is for any large area. But for anywhere I really want to clean it up the Gold Racer does the trick so for tot lots and similar situations the Gold Racer is the better jewelry machine and a clad coin vacuum. P.S. The main thing I really like on the Racer 2 is the ability to set three custom tone ranges each with their own tone, and also an iron volume setting. If I had to choose a machine just for jewelry detecting it would be the alternative to the DFX because of this. If there was a Bigfoot type coil for the Racer 2 then it is almost certain I would sell the DFX and replace it with the Racer 2.